Earn college credit while you are still in high school through College Credit Plus. College Credit Plus (CCP) is a program that allows students to earn college and high school credits simultaneously. It has replaced the Post-Secondary Enrollment Option (PSEO) program in Ohio. CCP is administered by the State of Ohio, and updates will be made as information becomes available. Interested students should complete an application for CCP at John Carroll University by April 1 for summer enrollment or fall enrollment or November 1 for spring enrollment. Students enrolled in JCU’s CCP program will take college courses on the JCU campus in University Heights. *Availability of courses may be limited so please understand that admission into the CCP Program does not guarantee matriculation into a specific course. The state has placed restrictions on the courses that can be taken during the first 15 credit hours of CCP participation: a student is permitted to take many of our 100 and 200 level courses in approved subject areas that do NOT require any pre-requisites during their first 15 hours of participation in CCP. To view these LEVEL ONE courses, please click HERE. We will begin to review spring CCP applications in mid-November and registration for spring courses will take place in mid-December. We will begin to review fall CCP applications in May and registration will take place in mid-July. Summer CCP applications will be reviewed beginning in late April. Acceptance letters along with “NEXT STEP” information will be sent out shortly after the applications are reviewed. Earning college credit before you graduate from high school is a benefit, possibly allowing you to earn your undergraduate degree in less time or giving you the option to double major, study abroad, or explore different subjects throughout your college experience. 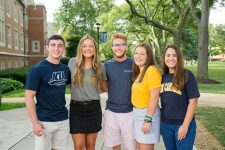 Eligible high school students may earn college credit at no cost to students or families in courses taught by John Carroll University faculty. All CCP students have access to the same student support services provided to fully matriculated JCU students. CCP students can take their courses with other JCU students and benefit from the array of experiences JCU students bring to our classrooms. Students can select from a list of approved CCP courses. Example Academic Pathways at JCU have been identified for CCP students seeking to take courses that meet degree requirements in bachelor degree programs. This is a new program, so you may have many questions – please consult the Ohio Department of Education website for a list of Frequently Asked Questions. Students may take any JCU course we offer provided they have the prerequisites and meet our suggested minimum curriculum requirements. Class seats must also be available at time of registration for CCP students; no forces will be done. See the Ohio Board of Education website for subject limitations for funding. Our course schedules can be found on our website along with course descriptions. 3.2 or higher cumulative GPA. Minimum test scores: ACT – 21, SAT – 1000 (old), 1080 (new) (Math and Critical Reading). ACT or SAT scores are required, we DO NOT accept any other tests and we DO NOT offer placement tests for participation in CCP. Submit Ohio Board of Education Letter of Intent to Participate Form by April 1. Submit completed JCU CCP application including required documentation: online application found here. Complete Authorization to Participate Form (once application is submitted). This form can be found here. High school transcript and test scores must be sent to the Office of Enrollment by April 1 or November 1. All fields contained in the application are MANDATORY, applications will NOT be reviewed if any fields are left blank. Public high school students must notify their school counselor by April 1, of their intent to participate in College Credit Plus. Non-public high school and homeschool students must submit paperwork to the Ohio Department of Education showing their intent to participate by April 1. This intent to participate form and steps to apply for funding can be found at Ohio Department of Education website. The cost may be subsidized by funds set aside by the Ohio General Assembly in each biennium and awarded on a first come, first-served basis. In order to receive this funding, the student must provide the state with the Application for Funding form and a copy of the letter of acceptance from the university. Nonpublic and home-schooled students will be notified by the state if their request for funding is approved.John Carroll University will need a copy of this funding letter before course registration. Course enrollment consideration may be limited depending on the academic background of the individual student. Please see recommended high school curriculum for suggested requirements. Current or previous John Carroll CCP students wishing to return for an additional year of coursework must speak with their advisor to complete any necessary paperwork. This should be completed by April 1. We will begin to review spring CCP applications in mid-November and registration for spring courses will take place in mid-December. We will begin to review fall CCP applications in June and registration will take place in mid-July. Summer CCP applications will be reviewed beginning in late April. April 1: Notify your school counselor if you intend to participate in College Credit Plus and submit Letter of Intent to Participate Form. After April 1, you will need permission from your school district superintendent to participate. April 1/November 1: Submit John Carroll University CCP application. June /July or Dec./Jan. (date TBD) : attend a mandatory student orientation, advising, and registration program. Parents will be invited to attend. Jennie Velez-Harris, at jvelezharris@jcu.edu or 216.397.4328.